Newly renovated, the Sheraton San Jose offers travelers modern accommodations and genuine service made for a relaxing and productive stay in the heart of Silicon Valleys tech region. Our hotel is conveniently located where San Jose, Santa Clara and Milpitas meet and just three miles from San Jose International Airport (complimentary shuttle). Enjoy easy access to 880, 237 and 101 transportation corridors, along with close proximity to leisure attractions. Our all-new cabana suites feature a large outdoor living space and a residential feel, perfect for an extended stay. Enjoy a relaxing nights rest on our Sheraton Signature beds, stay connected with high-speed Wi-Fi, get a workout in our modern fitness center, or relax with a dip in our outdoor Olympic-size swimming pool. Grab a bite to eat at The Bistro, open for breakfast and lunch or gather with friends or colleagues at the end of the day for happy hour at Lazio Bar & Lounge. 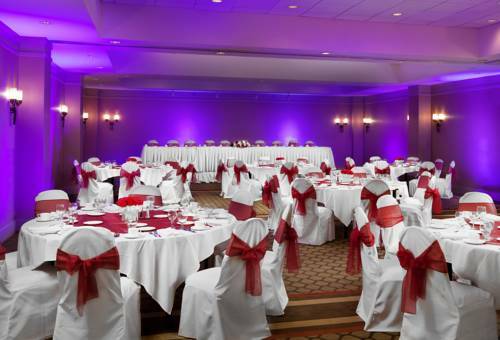 We also feature over 9,500 square feet of modern meeting and event space. The Bistro: The Bistro, a relaxed restaurant overlooking our garden courtyard and fountains, offers a breakfast buffet or menu plus lunch and dinner specials. Options include creative sandwiches, healthy choices, chef's specials and salads. Lazio: Cocktail Lounge/Sports Bar serving light fare/dinner.